It makes sense for the world’s largest electric vehicle fast-charger network to be built in the world’s most populous country. In China, a big power and automation technology group, ABB, has teamed-up with Shenzhen BYD Daimler New Technology Co to roll out the fast-charger network over the next 6 years. Of course there’s really no telling if the network will be the largest after the planned 6-year rollout. Other countries and companies may well catch up by then. Six years is a long time, especially when the likes of Tesla is rapidly rolling out its own network in the United States and Europe. Also, it has to be said that Chinese government efforts to bring a decent number of drivers into the electric car market (with government rebates) have not yet sparked much interest. The government in China has also introduced a direct current (DC) fast charging standard to try and stimulate market demand for electric cars, and to encourage technical innovation. Towards the middle of of this year, the rollout will begin with wall-mounted chargers distributed though DENZA dealerships, along with the firm’s new electric cars. The chargers will include a mobile app that will allow remote control and monitoring of charging stations. Image: Wikimedia Commons, Attribution-Share Alike 3.0 Unported license. 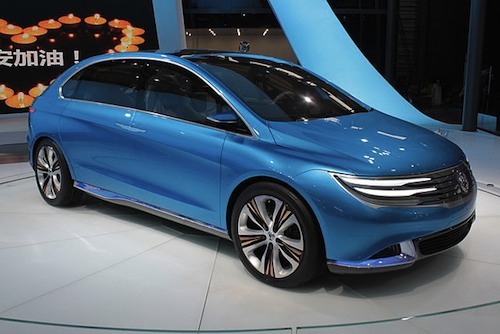 DENZA NEV (New Electric Vehicle) concept car at Auto Shanghai 2013.